The Folding Wheelbarrow offers a whole new approach to yard work! 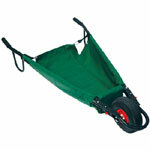 It makes hauling leaves, plants, garden tools, and other equipment, quick and easy. 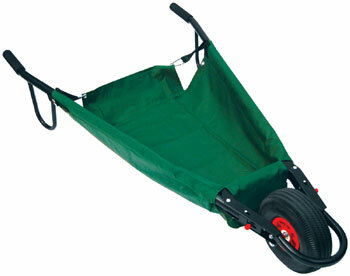 This new generation wheelbarrow features a rugged, powder-coated metal frame with non-slip rubber handles. It's easy to maneuver and holds up to 270 lbs. The waterproof, polyester tarpaulin removes easily for cleaning and folds quickly for storage. It's lightweight, weighing just 17 lbs. Dimensions opened are: 61 x 34 x 9 - folded: 61 x 12 x 9. 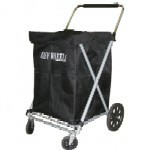 A versatile Folding Wagon that goes anywhere you go! 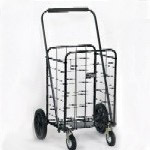 Perfect for gardening, shopping, or anything needing transport. 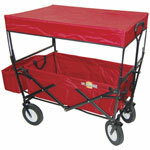 Folds easily and comes with a canopy and built-in basket. Supports up to 150 lbs. !